What is required for my Inspection? The City of Golden allows a combination inspection for all three (rough, final, electrical) if requested. For questions regarding code requirements of your project, please contact Scott Greer, Plans Reviewer at sgreer@cityofgolden.net. Jefferson County, including the City of Golden, is a participating party in C-PACE, which enables owners of eligible commercial and industrial buildings to finance up to 100 percent of energy efficiency, renewable energy and water conservation eligible Improvements. Financing is provided by private capital providers at competitive rates with repayment terms up to 20 years. Solar loan payments are often less than your electric bill and offer fixed rates and flexible terms. Contact your local bank or credit union to ask about programs. Solar Leasing or Power Purchase Agreements (PPA). In the PPA model, an installer/developer builds a solar energy system on a customer’s property at no cost. The solar energy system offsets the customer’s electric utility bill, and the developer sells the power generated to the customer at a fixed rate, typically lower than the local utility. At the end of the PPA contract term, property owners can extend the contract and even buy the solar energy system from the developer. In the lease model, a customer will sign a contract with an installer/developer and pay for the solar energy system over a period of years or decades, rather than paying for the power produced. Solar leases can be structured so customers pay no up-front costs, some of the system cost, or purchase the system before the end of the lease term. Similar leasing structures are commonly used in many other industries, including automobiles and office equipment. The ITC is a 30 percent tax credit for solar systems on residential (under Section 25D) and commercial (under Section 48) properties. Under current law, the ITC will remain in effect through December 31, 2016. Residential photovoltaic installations and some other renewable energy installations, like wind, up to 2 megawatts in size are 100 percent exempt from property taxes in Colorado. The system must primarily be used to supply electricity to the onsite home or building. Since 2009, Golden has actively pursued options for siting one or more community solar “gardens” in Golden to allow wider access to solar investment for residents and businesses. 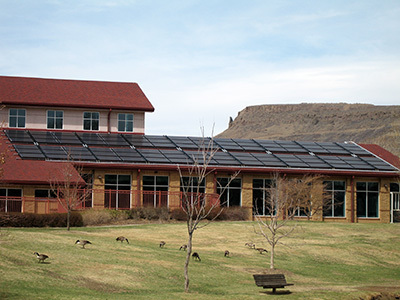 Community Solar Gardens are allowed in all zone districts in Golden (city code 18.28.030). Systems over 100kw in size require a special use permit (city code 18.28.040). In August 2013, City Council took a significant step forward toward achieving its renewable energy goals. Solar panels are under construction at nine City facilities including the Tony Grampsas Gymnasium, the City’s maintenance shops, Splash at Fossil Trace, Golden Community Center, and the Public Works and Planning Administrative Building. In 2007, Golden’s City Council passed Resolution 1792, which included a goal of reducing energy consumption by 20% and producing 50 percent of the City’s total energy consumption by renewable energy by 2017. In 2009, the City implemented energy efficiency upgrades for lighting, heating & air conditioning, and automatic controls (occupancy sensors, lighting shut-offs) and the solar thermal system to heat the Golden Community Center pool. The new solar PV project brings the City up to nearly 10 percent of the total electric consumption. Energy production is guaranteed through an energy performance contract with McKinstry Inc. The project also used the services of local solar installers. McKinstry will provide performance measurement and verification services to guarantee the City’s cost savings. The $2.9 million project is expected to be paid back with energy savings over 16 years.